With good weather suitable for our sea passage forecast for Saturday we were keen to get down to St Valery today and through the sea lock ready for a high tide departure the following day. We started promptly at the lock opening at 9am and were through Abbeville before the boats who had gone ahead were up and about. 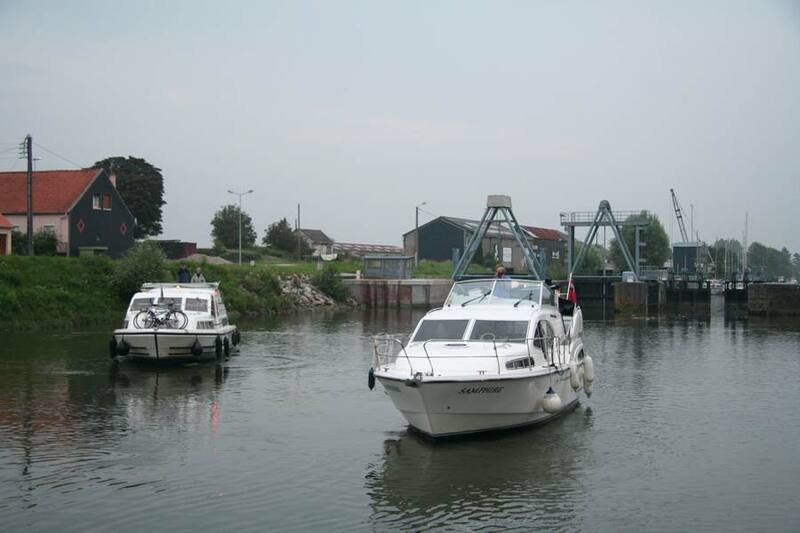 We had been warned of low bridges on the canal maritime between St Valery and Abbeville which had been described to us as tidal, although with a sea lock at St Valery we couldn't understand how this worked. 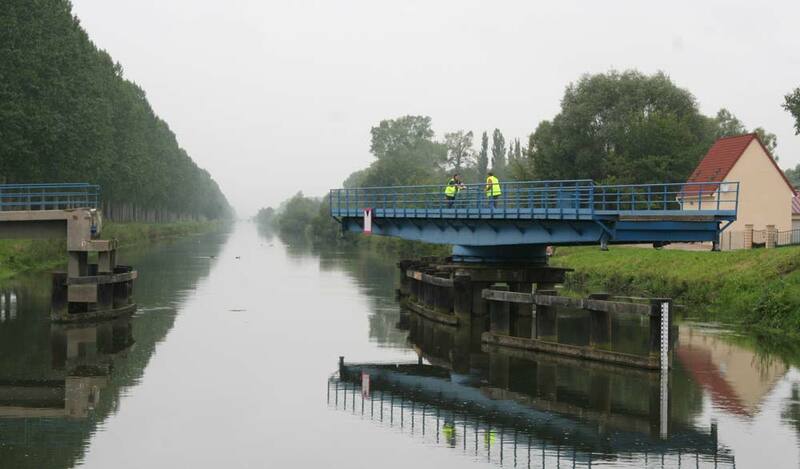 In fact the lower bridges turned out to be opening ones, and with the right phone call from the lock keeper to the bridge operators they opened smoothly as we approached. The level in the canal as far as Abbeville can vary by up to a metre but this is more to do with variable outflow at the sluices than ingress of tidal water. The sea lock at St Valery opens only an hour before high water, which wouldn't be until nine that evening, so we moored up at the canal pontoon, which despite the sign indicating a maximum stay of 72 hours, was occupied mainly by algae covered boats which had clearly been there a lot longer. It was just near enough to cycle to the town centre, a popular seaside resort which was gearing up for a busy bank holiday weekend. We would have liked to stay longer but the forecast for the Sunday was not so good, and we opted to take the best weather for our cross channel trip. Having not entered the port before we called at the harbour office for a copy of their buoyage list and harbour channel plan. 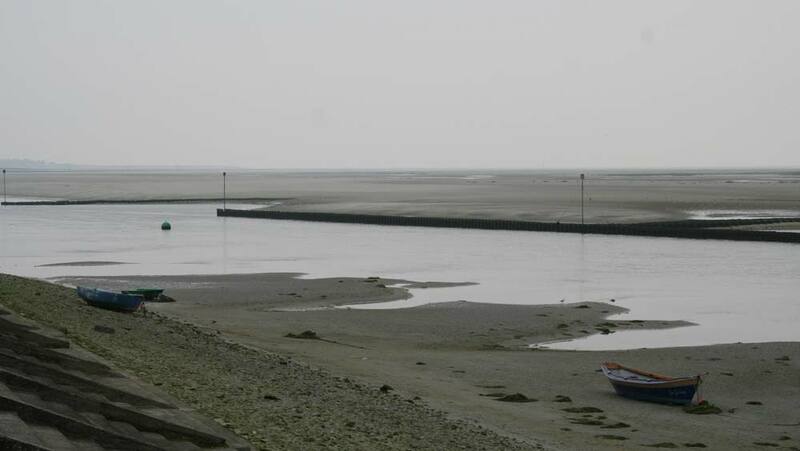 Crossing 8 miles of drying sandbank the winding channel changes frequently and the buoys are constantly managed to maintain access to the harbour. The huge sea lock eventually opened at 9pm after an amount of debate with the lock operator over bridge heights and draughts, and having reduced our air draught to 3.7m by dropping the mast we were asked to reduce our bridge height a little further, necessitating the complete removal of the canopy. In the event we had a clear 5.5 metres which would have allowed us to leave the whole mast up! We were greeted by a dory-driving harbour master who directed us to one of the hammerhead berths, one of the few that remain afloat at all states of the tide. Despite the lateness of the hour and the delay to our dining arrangements we stopped in the club bar after a visit to the harbour office for a drink with Eric and Claudia on Fiomina whose Bâle registered boat had accompanied us for the latter stages of the canal cruise.